I have not read the entire Lives of Tao series, by Wesley Chu, but I enjoyed the book I read (see review here), and I know that it’s put Chu’s name at the forefront of a new wave of sci-fi writers. 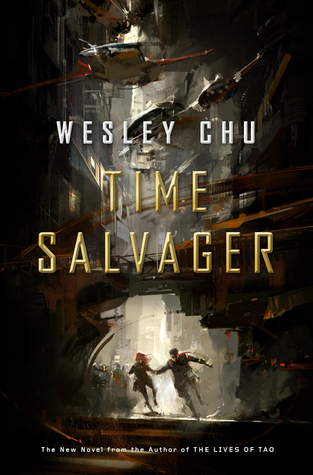 But his latest book, Time Salvager, is the book (series) that will cement his status as a powerhouse in the genre. Time Salvager follows James Griffin-Mars, a chronman (a time traveler) with the agency called ChronoCom. Being a chronman is difficult and lonely. Not many make it to becoming chronmen, and of those, not many survive to the age of retirement due to the dangers inherent in time-travel. And so chronmen tend to be angry, bitter, and best left alone. Chronmen have a partner, rooted in the current time, to monitor them and try to get them back before they get in too much danger. James’ only ‘friend’ is his handler, and even that is a tenuous relationship. And because we are dealing with time travel, there are rules, and there are laws. The rules are directions, placed on the chronmen, by the organization. The rules are laws about time travel that everyone accepts to be true and not to be violated. Most of these rules and laws were established by the Mother of Time, a brilliant woman named Grace (who’s approaching a very old age when we first meet her in a trip back in time). The dangers, then, to the chronmen are obvious…they are traveling back to a disaster of some sort, and they are also interacting with people who they often know are about to be killed … often is horrible ways. It’s no wonder that chronmen are surly sorts. But James can’t bear the thought of a specific woman dying during one of his jobs, and he brings her back with him, violating one of the LAWS about time travel, even though he suspects she won’t survive long since everything he’s been taught suggests that living things can’t travel forward in time. Bringing the woman back makes him a traitor to ChonoCom and an outlaw. And he has the ability to not only hide anywhere he wants, but anyWHEN as well. And the woman’s survival has James questioning everything he ever thought he knew about time travel. There are so many wonderful things at work here. First there is the concept and the story of the resource-poor world in the future … so badly in need of materials that it’s worth paying to send people back in time to harvest things. There is the story of corruption and greed that goes along with any multi-billion dollar industry and the secrets that those in power will kill to protect. But there is also the remarkably personal story of James Griffin-Mars … the daily struggles with all that he has seen and experienced in the past, as well as his unexpected future. And somehow Wesley Chu has managed to build on all of these pieces and still write an action-packed sci-fi thriller that will have you turning the pages, anxious to read what’s next. It’s pretty clear that there will be a sequel, though I feel the book stands on its own well enough, and I will certainly look forward to the next story in this realm. And I’d also like to add that I think the cover, as shown above, is really fantastic.